*They have a sweat smell, that should wash out. *All items sold as is, all warranties void. 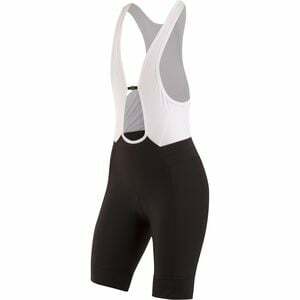 If you've never worn bib shorts before and have been hesitant to buy a pair, Pearl Izumi's new ELITE Pursuit Bib Shorts make a versatile introduction to the world of bibs. Admittedly, the fit and price of bib shorts can be intimidating, but with the ELITE Pursuit, you'll get the chance to try a more affordable, versatile option â€” and you'll soon understand why everyone in your weekly ride club is telling you that you just need to try bibs already. Pearl Izumi starts with its tried-and-true ELITE Transfer In-R-Cool fabric to give the shorts a contoured fit that won't bunch or chafe while rapidly pulling moisture away from your skin so you can stay cool and dry as you ride. The shorts' drop tail construction addresses one of the more valid complaints many of us have heard and made about bib shorts: they don't easily accommodating mid-ride nature breaks. The drop tail design promises to make those occasions far less of a hassle. Pearl Izumi includes its ELITE Pursuit 1:1 Chamois, which combines plush, high-density foam layered under forgiving four-way stretch fabric to ensure you stay comfortable without feeling restricted as you begin to take on longer, more demanding rides. Lightweight, breathable mesh bib straps sit cleanly under a jersey or over a base layer without trapping heat, while silicone leg grippers promise to keep the legs' nine-inch inseams firmly in place without making you question whether or not they're cutting off your circulation.